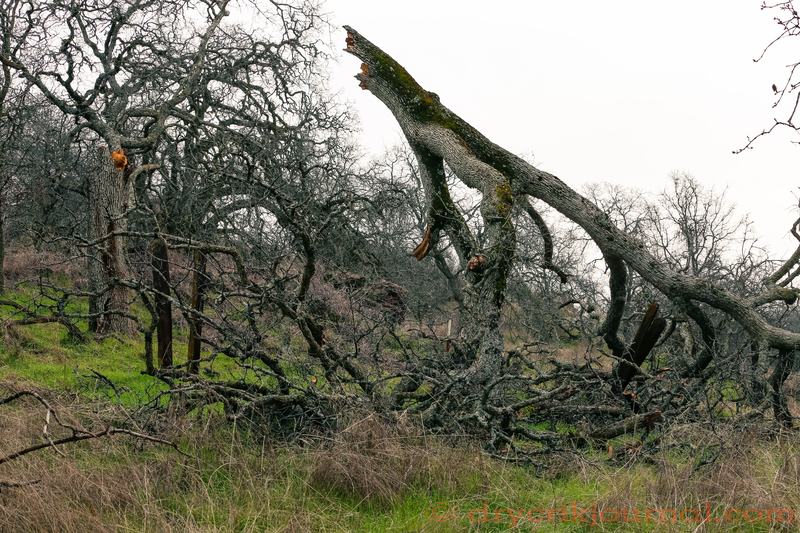 Unbelievably, only one wire is broken beneath the top of this Blue Oak, a victim of the drought and the high winds from the last storm on the Paregien Ranch. Kubota only, the roads are wet, water running in every crease. It will take at least a week without rain before we can get back in a pickup at about 2,400’, or before gathering horseback. The long-range forecast is for more rain at the end of next week. Not a business to schedule by the calendar, the three major variables we must contend with are the weather, the market and politics. After four years of drought, we’ve found new extremes to our adaptability, thinking well outside the box of past-experience. Just how we will adapt will be interesting. Furthermore, the cattle market is off about a third of the prices received three years ago, and most producers have had to cull their cow herds so deeply that reduced calf-crops may not cover costs. No one knows the impact of the current politics, other than markets for almost every commodity will probably not be stable. Additionally, much of the domestic beef business depends on exports, of late reduced by a stronger dollar. With existing global trade agreements under fire, there is perhaps less certainty about the market for beef since the fiasco of the first Dairy-Out Program nearly 40 years ago. We have plenty of places to busy our hands and occupy our minds as we develop a near-term plan around all three variables of this business. Even though we are at the mercy of the weather, the market and politics, we do have job security, for a while. This entry was posted in Photographs, Ranch Journal and tagged beef business, market, Paregien Ranch, photography, politics, weather. Bookmark the permalink. Is it not a somewhat self correcting, although lagging market, of supply and demand? Looks like someone is making more as I don’t see a reduction in retail prices. A shame you can’t sell direct. Oh yeah, it is self-correcting over time. The weather is always a wild card, but uninformed political decisions can be devastating. However, most of the pundits within the beef industry view the new administration as positive. My concerns are of a wider scope, I suspect, and a minority view at that. Time will certainly tell. We have sold beef directly in past years, both grass fed and grain fed for others and ourselves, but in such small amounts they had little impact on our books. We have opted in recent years to buy 4H and FFA project steers for our own consumption to support the kids, paying a little more for our meat, but at least we know they were fed well.